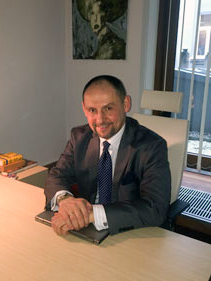 Sławomir Wołyniec – is a PhD level graduate from the Warsaw School of Economics at the Collegium of Management and Finance (12th Edition of the Course), and MBA graduate from the Faculty of Management at Warsaw University. He completed the course for candidates to Management and Supervisory Boards of companies with Polish State Treasury equity participation. He also holds the Certificate of Professional Competence issued by the Minister of Finance (pursuant to art. 19, par. 3, Act of 29th July 1992). He has 20 years of professional experience which he gained as entrepreneur conducting his own business activity for his own account, and principally as a member of management boards of commercial law firms and Warsaw Stock Exchange listed companies. Since 1988 he has been professionally connected with the following sectors: large-scale trade in raw energy materials, light industry, trade in receivables, construction, corporate restructuring and international trade. He is married with four children and one grandchild. His interests and hobbies include: Christian philosophy, playing the guitar and keyboard instruments, chess, winter and motorboat sports, sport shooting, boxing, and fitness.